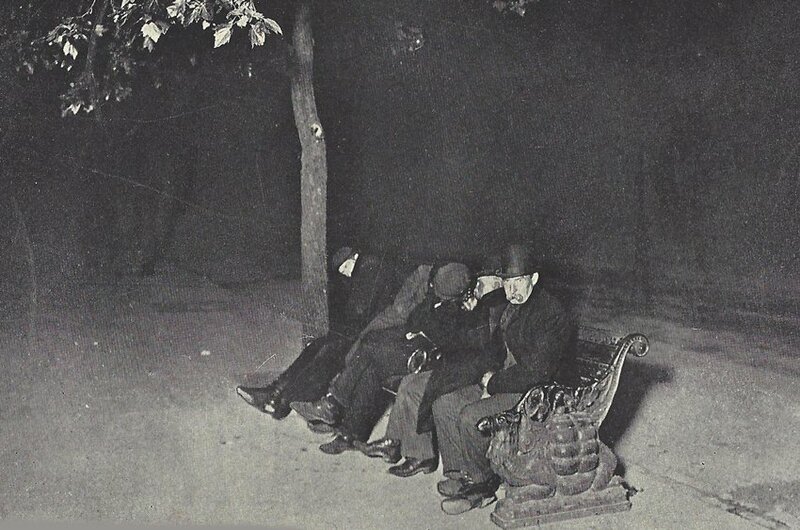 A Night With The Victorian Homeless Of London. Come, let us go on a journey back in time and walk through the night hours on the streets of London in August, 1894. Our guide for our journey into the past will be a Victorian journalist, whose article was reprinted by The Woolwich Gazette on August 17th, 1894. “It was not the kind of night on which anyone would choose to walk abroad for pleasure. Heavy rain had fallen during the evening, filling up every hollow in the roadways, and making the pavements shine like mirrors under the rays of gas and electric, light. A summer-mist had settled over the West-end, and showers descended at intervals with depressing regularity. Everyone who could by any possibility obtain shelter had done so. Many who would have slept in the streets had it been fine now broke on their small stock of money for the fourpence necessary to obtain admission to a common lodging-house; others, whose means would not allow of fourpence, had paid a copper or two for the shelter of a Salvation Army refuge. Were there any, in the richest city in the world, who could not even obtain the penny necessary for admission to the Blackfriars shelter? To answer this question the more accurately, I set out about midnight, and went among the outcasts as one of themselves. The public houses were closing their doors, the great mass of theatregoers had already departed by the last train to the suburbs, and the main streets were becoming comparatively deserted. Soon, the street wanderers became conspicuous. Slouching along the pavement, or standing idly in front of the print shop windows, it was easy to distinguish them from the others who find business in seeking pleasure in the West End at midnight. Their clothes were, of course, well worn, and of that peculiar neutral tint common to very old garments, and all had their coat collars up, as a slight protection against the weather. Most had pipes, often empty, in their mouths, and they crept slowly on, with hands is pockets, as though not knowing what to do or where to go. In Charing Cross-road, near the Trafalgar Square end, is a circular seat around a tree. On this a dozen were sitting, half of them men, and half elderly women, about thy years old. Several others were waiting around, leaning against lamp-posts, watching their opportunity to take the place of some of the sitters, when they got up. I have seen many miserable specimens of womanhood in my time, but never have I come across any so repulsive as those sitting around the tree. Big, coarse-faced, ragged, and dirty, they seemed to have touched the bottom rung on the ladder of life, and to have sullenly abandoned hope of rising higher. The next group I came across consisted of three men and one woman, crouching over the overhanging entrance of a shop in Oxford-street. I took my place among them, and as an introduction, took out the inevitable pipe and asked for a match. They had none, and their own pipes were low from shortness of tobacco, so it was a somewhat difficult matter to get the light I wanted. “Here, give me your pipe,” said one. With the utmost sangfroid he put it in his own mouth, and, after a few pulls with it and his own clay, he managed to ignite it. Then he handed it back to me, and between the puffs, we started talking to one and another. Bit by bit their stories came out. The woman had trudged from a town thirty-three miles in two days. She had been a servant, and she thought that she might get a situation in London. The night before she had slept in the open in the country; to-night, footsore and dead beat, she was seeking such as could be had on the stone steps of a shop doorway. One of the men, a fine big fellow, a splendid specimen of the navvy, had only reached London a couple of days before. Having been thrown out of work in the country, he had set out on the usual tramp for London, only to find that he had jumped out of the frying pan into the fire. His face and clothes were tidy and clean, and he carried his wicker food and tool basket by his side. The night before he had slept on the streets, he was doing the same this night, and he had not the slightest prospect of getting anything to do on the coming day. The third in our party had been selling flowers in the streets during the day, and had not earned enough to procure him a shelter; while the fourth; a tall gentlemanly fellow, dressed in black, was too tired to exchange a word with us, and sat on the stones, his head resting on his arms, dozing fitfully. “The police won’t leave us alone, you know,” said the navvy. He had not long said this before he heard a regular footstep approaching us. The woman had dozed off, but a push or two soon roused her. The policeman drew near, and we all did our best to look as though we were ordinary travellers resting for a moment from the passing shower. The constable must have noticed our movement and known our miserable pretending, but he was merciful. He steadily kept his eyes fixed on the other side of the road, and hurried by without casting a glance our way. After remaining a few minutes longer with the little company, I continued my tramp. Under the balcony of the Palace Theatre, and in almost every place where a slight shelter could be had, homeless men were standing or sitting. There were none in Trafalgar-square, the favourite resort a few years ago, but under the Adelphi Arches was quite a small crowd. Those who know the arches will be aware that the wall goes in slightly on one side, leaving a ledge about six inches wide, three or four feet from the ground. On this, the men were trying to sit, out of reach of the wet. On the open seats of the Embankment, there were not so many as I had expected, though wherever a seat was as all under shelter, it was crowded. In that early morning hour, at two o’clock, with London at its quietest, strange thoughts passed through one’s mind in that walk down London’s finest boulevard. The rain had, for the time, ceased, though the air was still full of mist. The Thames, stretching away from the Houses of Parliament to Southwark, looked so beautiful. The innumerable lights of the Embankments and bridges, the brilliant reflections on the surface of the water, the great piles of masonry looming up mysteriously into the semi-darkness, all seem to tell of wealth, beauty and power. Yet, I had but to turn my eyes to see ragged wretches creeping along in the shadows – minus shelter, minus food, minus all that makes life attractive or even bearable. Surely, there could be no greater contrast? At such a time it is little comfort for one to seek to console himself with the maxims of orthodox political economy. It is one thing to talk of the fittest in the calm atmosphere of a scientific gathering, but it is quite another affair to one’s self to behold the crushing of the unfit. I took my place with five others on an Embankment seat. Two or three were chatting loudly among themselves. I could not help observing a noticeable difference between the men on the Embankment and the group in Oxford-street. These here, with a few exceptions, struck me as being confirmed loafers, and, in a conversation that I subsequently had with the police on duty, this impression was borne out. “Why don’t you let them all sit still?” I asked. “If we did every seat would be filled up the whole night, and many would be so horribly dirty that no one could sit on them the next day. You would not believe how filthy many of these loafers are. I have known cases where they have been so covered with vermin that the wonder is they were not eaten right away. But we do let them rest a bit, then we send them on into the City, and the City police send them back to us. Most of the men here are simply lazy; and won’t work on any condition. The night was passing, and soon there came a stir. Dawn was slowly breaking, the bye-ways of Fleet-street were already throbbing with the pulsations of many printing presses, newspaper carts were rattling up the Strand, and Covent Garden was showing signs of business.